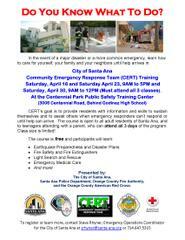 The City of Santa Ana is holding Community Emergency Response Team (CERT) Training to provide residents with information and skills to sustain themselves and to assist others when emergency responders can’t respond or until help can arrive. The course is open to all adult residents of Santa Ana, and to teenagers attending with a parent, who can attend all 3 days of the program. Class size is limited! To register or learn more, contact Steve Rhyner, Emergency Operations Coordinator for the City of Santa Ana at srhyner@santa-ana.org or 714.647.5315. Presented by the City of Santa Ana, Santa Ana Police Department, and the Orange County Fire Authority.